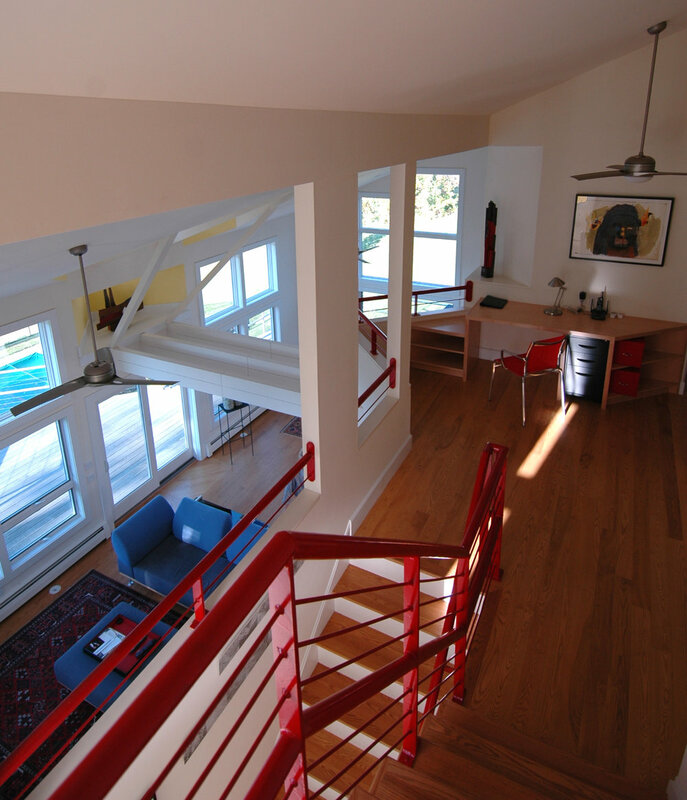 Our client purchased a "contemporary" residence built in the late sixties. Situated on the northern slope of a prominent ridge, it commands a 25 mile view on a clear day. It was to be a weekend residence that would eventually become full time for a businessman, amateur sculptor from New York City. We were directed to maintain the location of the rooms but create "an interesting flow of space throughout the house" as well as create more space where it was required. Taking advantage of the spectacular view was a prime requirement. The house looked as if it had been built on a shoestring budget by amateur builders before the energy crisis of the early seventies. The North facing wall of the Living Area had been built with 2x4s and was structurally and thermally unsound (it moved when one leaned on it, and was insulated with fiberglass batts compressed to about 1" thick throughout). To provide structural as well as thermal substance, 2x3 furring was added all around and new "Icynene" foam insulation was sprayed into the deeper cavity. The plumbing and electrical systems had to be replaced. 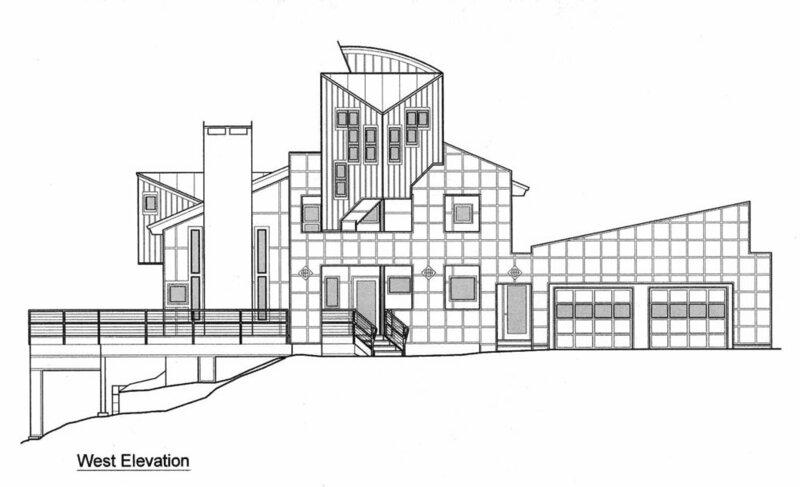 In various places, the integrity of the structure was so compromised that at one point, serious consideration was given to a demolition option. However, it was decided that for the most part, the structure was adequate to work with. In the end, the house was pretty well gutted in repairing existing problems and making the changes required by the plans. The entry side exterior posed another problem. It was unattractive, and there was no spatial hierarchy in the entrance processional. The solution was to build a wall to "hide" this elevation and provide some visual interest as one approaches the house. This wall also supports the new Tower Room built on top of the roof and provides an interesting spatial sequence as one enters the house. In the Summer, entry is through the Foyer and in the Winter, through the air lock provided by the Mud Room. In the end the solution to meeting functional requirements and, at the same time providing a visual unity, lay in pushing and pulling on sections of existing walls, cutting openings and adding structural elements that also function as spatial elements. 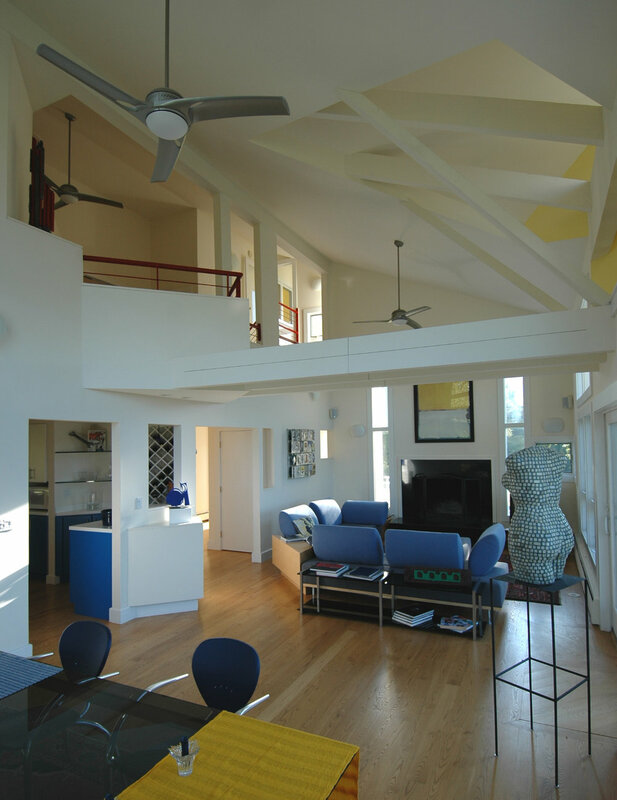 The balance of natural light throughout the house was accomplished by a series of openings in interior walls along with careful placement of a few additional windows on exterior walls. The result is a constantly changing light throughout the day as well as throughout the seasons. "When I go out at night I leave the tower room lights on so when I come back home I can see the house from across the valley. The stepped windows make an interesting pattern and the tower is like a beacon that welcomes me home. I love the way it looks when I drive up to the house; it looks sculptural."